Part of the problem I have with the majority of the Millennium series is how basic and uninteresting most of these films feel. Most of them act like coloring books by the numbers, with very generic and bland stories that we’ve either seen a dozen times before or just never do anything with its concepts. We’ve already seen this first-hand with entries like “Godzilla 2000” and “Godzilla X Megaguirus,” both of which had cool ideas, like storm chasers that follow Godzilla or imagining a world where the first Godzilla never died, but ultimately does nothing of value with that. We have yet another Millennium film that does just that with “Godzilla X MechaGodzilla.” This is sort of another one of those “What if” story ideas, in this case is it “What if the Oxygen Destroyer still killed Godzilla, but did not destroy his bones?” It is a very minor change and one I do not mind, since the first Godzilla still died to the Oxygen Destroyer. In this case, the film’s answer to that question is – The Japanese military has captured Godzilla’s bones and now plans to make a giant robot around them to fight other giant monsters…like you do. “Godzilla X MechaGodzilla” once again takes place in its own little universe, separate from any other Godzilla movie outside of the first one. Although, strangely enough, the filmmakers say that some other Toho films from the 1960s happened as well, in particular “Mothra” and “War of the Gargantuas.” Except this movie also changes the events of those films as well – In “War of the Gargantuas” there were two giant monsters, Gaira and Sanda, supposedly created from the remains of Frankenstein (long story, but check out “Frankenstein Conquers the World” if you’re interested). But “Godzilla X MechaGodzilla” erases Sanda from history, saying there was only Gaira who was defeated by their newest invention, the Maser Cannon, because “Maser” sounds way cooler than laser. The Millennium series seems to take joy in screwing with the history of Toho’s giant monster movies. The film begins in 1999, when a huge typhoon hits a Japanese island. But in the middle of that storm, a new Godzilla rises out of the ocean and starts causing chaos and destruction. The military is sent into deal with Godzilla, but a few tanks and a maser cannon can only do so much to him. The government is surprised to see Godzilla return again and they find themselves unprepared for another monster attack, since the last kaiju appearance was supposedly over 30 years ago. This leads the prime minister to enact a new battle plan to take care of Godzilla. Japan’s leading experts on biology, mechanical engineering and robots are called into to show that the government have gotten their hands on the bones of the first Godzilla. The government officials say they want these scientists to construct a cyborg body around the bones, which could potentially be their strongest weapon against Godzilla and any other monster that attacks Japan. 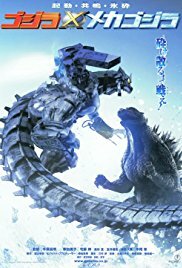 There’s a simple question I’ve always wondered with this movie – Why do they need Godzilla’s bones to be the base for their giant robot? It’s not like the bones carry any special power or give the robot a power boost, they’re just inside this thing. In fact, it sounds like it would be more trouble than its worth, since having the bones of a dead animal inside your fighting machine can go bad fast. If they needed it as a frame to build around, then just make a metal copy of Godzilla’s skeleton and use that for your frame. But no, they had to try and make it sound cool by saying this robot is built around Godzilla’s bones, whether or not it makes any logical sense. This leads us to our first look at MechaGodzilla, my favorite Godzilla villain. Of all the monsters Godzilla fought more than once, MechaGodzilla was always the one that seemed to give him the hardest time, easily able to overpower Godzilla and was almost always a few steps away from ending the King of the Monsters for good. It’s a pity that this MechaGodzilla leaves such a disappointing impression. The first slip-up is that they rename the robot Kiryu (which is Japanese for “Metal Dragon”). They hardly ever call this thing MechaGodzilla, even though that’s his given name in the title. Any time they call MechaGodzilla Kiryu, I roll my eyes at their pointless need to give their robot two names. But the bigger problem I have with Kiryu is how they present him during his fights with Godzilla. I’ll talk about this more in detail when we get to other better entries that have MechaGodzilla, but Godzilla’s mechanical copy is supposed to be leagues strong than Godzilla, equipped with weapons that can destroy entire city blocks, or send Godzilla’s atomic beam back at him, or being able to pierce Godzilla’s second brain and cripple him. He is the ultimate anti-Godzilla weapon. This MechaGodzilla? His missiles and lasers hardly ever warrant a reaction out of Godzilla, the maser cannon in his mouth does little more than make Godzilla slightly annoyed, and all it takes is one or two blasts of Godzilla’s atomic breath to bring Kiryu to a screeching halt. For the majority of the movie, it comes across like Godzilla has no problem walking right through MechaGodzilla, like he was made of cardboard and was tossing Nerf darts at him. This isn’t an anti-Godzilla weapon, it’s a five-year olds’ attempt to play the same game as his older brother and only gets mangled as a result. Admittedly, the movie is attempting to go for a realistic approach to MechaGodzilla…sometimes. 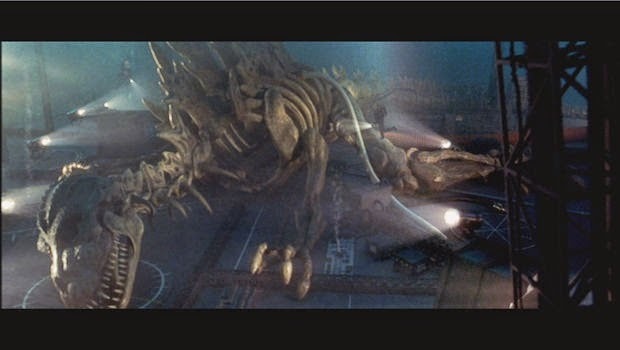 Aside from the whole “the original Godzilla bones are inside our giant robot” thing, they also equip Kiryu with a cannon that can freeze anything to absolute zero. While that is a neat concept, it does go against the realistic approach to Kiryu, so why couldn’t they at least give MechaGodzilla the ability to tank Godzilla’s atomic breath like the previous MechaGodzilla’s? Also, every attempt they make to use the Absolute Zero Cannon on Godzilla goes horribly wrong, so the thing never works the way they want it to work. It also drains Kiryu’s power cells every time he uses it, so it seems like a waste of space if they cannot get it to work right and use up all their power. Why not just build an Absolute Zero Cannon and attach it to a large tank? Why put on the fragile and malfunctioning robot that cannot fight Godzilla very well? I don’t think the “realistic” approach to Kiryu works well in this movie. Since Godzilla remains his usual unstoppable and unflinching self, having a robot fight him that’s made from material that he can easily rip apart and toss around like it was nothing makes for a stale fight. It becomes even more annoying because they named it MechaGodzilla, a monster has nearly killed Godzilla on more than one occasion. If you’re going to do MechaGodzilla properly, stay away from a realistic approach and go all-out crazy instead. One thing people have pointed out about “Godzilla X MechaGodzilla” is that it feels very similar to an anime. In particular “Neon Genesis Evangelion,” about giant monster gods that want to bring about the end of the world and humans combat these monsters by building their own robot cyborgs, which admittedly took a lot of inspiration from Godzilla in the first place. For a while, I didn’t see the similarities, but now I notice a lot of the same tropes – An overly oppressive military force that does everything they can to protect their country, putting their fate in the hands of emotional and flawed individuals while they face an overwhelming threat. One big difference between the two though is the sense of a war. Both “Evangelion” and this movie feel like they’re fighting an on-going war against an impossible foe. In “Evangelion,” that feeling makes sense, considering that there are multiple monsters that keep them on their toes. But in “Godzilla X MechaGodzilla,” they only ever fight one enemy – Godzilla. Can your “war” truly be considered a war if you’re only fighting one creature? That’s a fight or struggle, not a war. As a result, I feel the military aspects of “Godzilla X MechaGodzilla” are overplayed, especially since they dominate most of the human scenes. Most of the characters only spout the same general platitudes about how strong the military is, and that they’re capable of anything, and they’ll never surrender. And then they get trounced by Godzilla, so now they just look like buffoons. The fight scenes are okay, if a bit too long at parts. 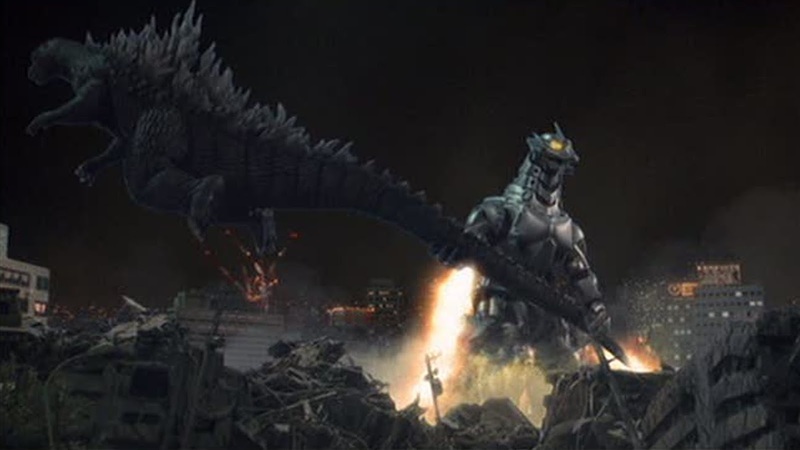 The entire third act is the final battle between Godzilla and Kiryu, with a few cool scenes after MechaGodzilla discards most of his missiles and lasers to gain better mobility and starts smacking Godzilla around. Since the remainder of the movie is pretty beam-heavy, it is nice to see MechaGodzilla wailing on Godzilla and then tossing him around by his tail. The music in “Godzilla X MechaGodzilla” is also pretty good. It was composed by Michiru Oshima, who also composed “Godzilla X Megaguirus” and led to a new theme song for Godzilla that is pretty catchy and atmospheric. There’s a great sense of triumph and grandeur to the music here, which makes it stand out a bit more from the other Millennium films. Overall, “Godzilla X MechaGodzilla” is a slightly-improved version of “Godzilla X Megaguirus,” but only just barely. The story does its job well enough and the action sequences are alright, but it doesn’t feel like it amounts to anything. The film doesn’t do anything particularly well and just makes me wish I was watching better scenes with MechaGodzilla. There is nothing of value to be found here, but it isn’t that terrible either. This is just a film that exists to take up space.